The Mitsunobu reaction is an organic reaction used to convert a primary or secondary alcohol into a variety of compounds using DEAD and triphenylphosphine. The final product depends on the acidic reagent (the conjugate acid of the nucleophile). The mechanism begins with attack of PPh3 on DEAD which forms a zwitterionic intermediate. This intermediate then deprotonates the acidic compound to reveal the anionic nucleophile. The alcohol starting material then binds to the phosphonium ion and the nucleophile performs a SN2 attack to yield the final substitution product with inversion of stereochemistry. 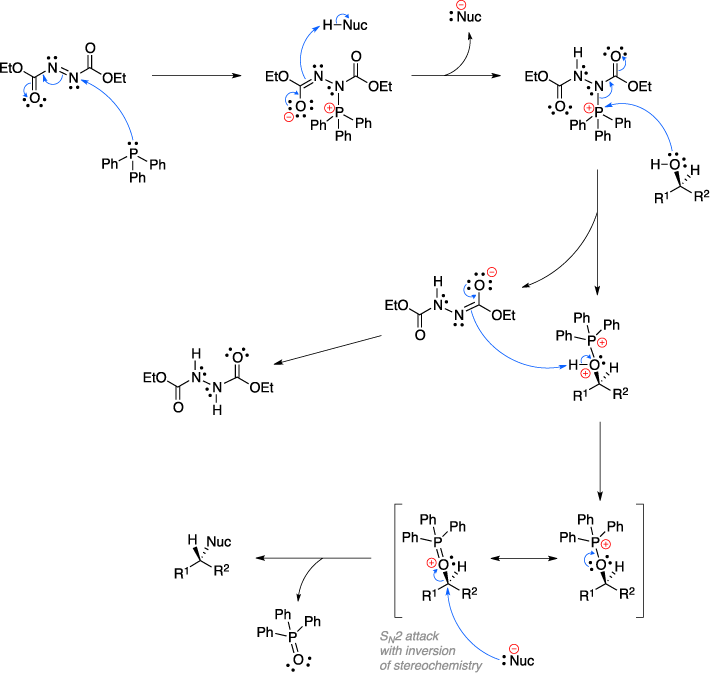 The formation of a strong P=O in the by-product drives this reaction forward. Mitsunobu, O.; Yamada, M.; Mukaiyama, T. Bull. Chem. Soc. Jpn. 1967, 40, 935–939. Mitsunobu, O.; Yamada, M. Bull. Chem. Soc. Jpn. 1967, 40, 2380–2382.